For many homeowners, growing food in a backyard garden is both satisfying and practical. Not only can eating home-grown fruits and vegetables help families control the food that they consume on a regular basis, but it can help reduce the cost of monthly grocery bills. At Blooms Landcare, we want our clients to have the ability to produce the garden goodies that they want while also keeping their outdoor environment healthy and thriving. Here are some garden design ideas to help. You can promote good soil and the better overall health of your yard when you include compost in the regular care and maintenance of your yard. Consider including an area of your garden space that is set aside just for the creation of compost. You can collect yard and kitchen scraps that will break down together into a nutrient-rich matter that you can work back into your garden’s soil over and over again. In order to keep your outdoor environment healthy, consider garden design ideas that incorporate plants that require less water. A water-wise design can cut down on the amount of water your garden will need to thrive throughout the seasons. Plants that are drought-tolerant are better able to hold up to harsh summer heat without the need for the excess watering that can deplete your local water sources. Trees and vegetation can help clean the air around your home. Plants give off oxygen, purifying their surroundings of environmental toxins that can be harmful to you and your family. Implement gardens that are full of foliage for both beauty and health purposes. 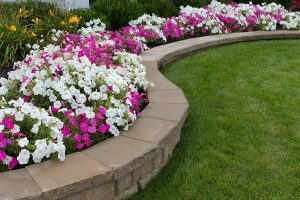 If you need help with including garden design ideas that are good for the environment in your yard, let the professionals at Blooms Landcare help. Our team members are skilled at creating and producing gardens that lower your impact on your surroundings, while also providing you with the bounty that you expect year after year. Call us at (817) 688-5352 today.